In 1981 I decided to seek out materials on nonviolence and nonviolent action so that I could learn more about it. I had not been reading for long when the routine reference to Mohandas K. (or Mahatma) Gandhi, about whom I had heard a little and knew of his role in leading the Indian independence struggle, forced me to pay more attention to his life and work. So I sought out his writing and started to read some of his published work. An Autobiography: The Story of My Experiments with Truthwas an obvious and early book but there were many others besides. I also read many books about Gandhi, to get a clearer sense of his life as a whole, as reported by his coworkers and contemporaries, as well as documented by scholars since his death. And I spent a great many hours in a library basement poring over The Collected Works of Mahatma Gandhi. Fundamentally, as Leroy Pelton characterized it, Gandhi understood that the truth cannot be achieved through violence (‘which violates human needs and destroys life’), because violence itself is a form of injustice. In any case, violence cannot resolveconﬂict because it does not address the issues at stake. To reiterate then, for Gandhi there was nothing undesirable about conflict. 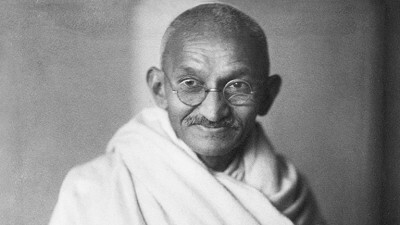 However, Gandhi’s preoccupation was working out how to manage conﬂict without violence and how to create new social arrangements free of structural violence.The essence, then, of Gandhi’s approach was to identify approaches to conﬂict that preserved the people while systematically demolishing the evil structure. Nevertheless, he ﬁrmly believed that structural puriﬁcation alone is not enough; self-puriﬁcation is also essential. It turned out that developing this strategic theory and strategy was simpler than the original aim (understanding violence) and I have presented this strategic thinking on two websites: Nonviolent Campaign Strategyand Nonviolent Defense/Liberation Strategy.